Last month we created the Dividend Growers portfolio, a long-term portfolio of 25 holdings with a dividend growers strategy—quality companies that are growing both earnings and dividends. Read the introductory post about this project here. In this post, I want to fill in a bit more detail about how we selected the holdings for this portfolio and then run a quick performance check. Dividend growth is an appealing strategy to many investors because it combines longer term capital appreciation with the more immediate reward of dividends. 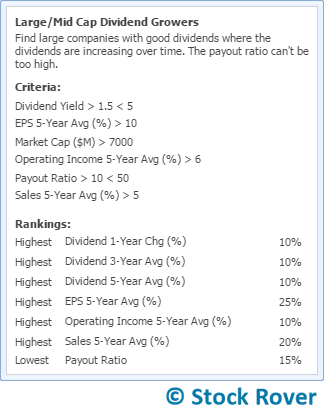 The goal is to achieve a strong total return that ideally exceeds what you might make with a strictly capital appreciation or strictly dividend yield strategy (learn more about dividend growth versus dividend yield, and why we prefer the dividend growth tack, here). Although there were no singularly disqualifying quantitative tests, each company as a whole had to present a strong case for being a dividend grower. For example, a company with high debt could be included as long as its other qualifications looked good. On top of the fact that each holding needed to meet most of the above criteria, the portfolio required a diversity of industries and sectors, as well as a collective risk level that was similar to the overall market. I also ran a version of the screener with no dividend yield minimum. I saved the results as a watchlist and added to it the tickers from the Dividend Growers Fantasy Portfolio article we ran last year. I then poked and prodded this list to separate out the keepers, exploring multiple table views, financial history, news articles, analyst ratings, Morningstar grades, and price performance. Due to time constraints, I wasn’t able to do a deep dive on every single stock that ended up being included in the portfolio (meaning I didn’t get into 10Ks and earnings transcripts for many of the holdings). For this reason, some of the picks feel a bit chancier than others. Furthermore, blue chips such as Boeing (BA), Honeywell (HON), and Home Depot (HD) may have enjoyed the benefit of the doubt more than smaller companies that did not make the final cut. I’ll be running deep dives on the portfolio holdings in the coming months to further investigate these picks, and making trades accordingly. The table below summarizes the dividend payouts and growth for all the companies in the portfolio. The bottom line shows the averages for the entire portfolio. The total dividend yield is a modest 2.0%, and the highest yielder is Kimco Realty (KIM) at 3.6%. The average payout ratio is just 29.5% and the free cash flow payout ratio (which is actually a more accurate ratio to use than the standard payout ratio) is even slightly lower than that. All of this means that there is plenty of headroom for dividends to safely increase. Of course, a modest yield with relatively low payout ratio does not a dividend grower make—all of these companies have a solid history of increasing dividends (over 21% per year on average in the last 5 years) plus have the financial standing to do so in the future. Amgen (AMGN) is the newest dividend payer of the bunch, but it has the zeal of the converted. Since introducing a dividend in 2011, it has increased it from $0.56 per share to its current $4.00 per share, which is the second highest in the portfolio. Southwest (LUV) by far has the lowest dividend at $0.30 per share and a yield of only 0.7%. However, this still represents a respectable increase from past dividends ($0.02 in 2011). The hope is that LUV will continue to ratchet up its dividend yield as its share value appreciates. Let’s see how the portfolio has done in the 4 weeks since inception. For interest, I’ve kept an equal-weighted version of the portfolio to compare against the main portfolio (see the original allocations here in the ‘Balanced Value’ column). Since March 31, the Dividend Growers Strategy portfolio has achieved a 0.7% rate of return, just slightly higher than the equal-weighted version of portfolio. This means that the slight allocation differences have created a slight performance difference, in the right direction. It has outperformed the S&P 500 by about 0.1% so far. In the longer term, we are hoping to widen that gap. 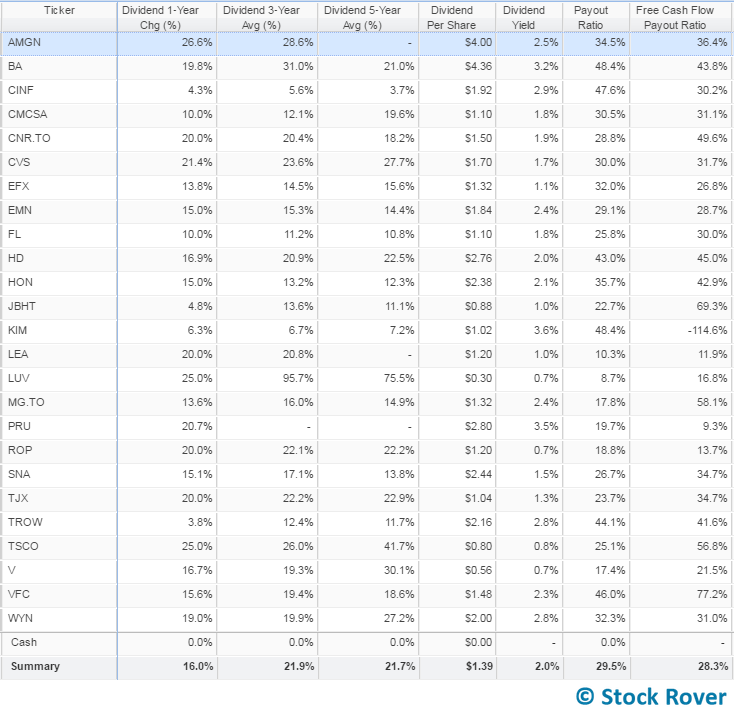 Digging into the individual holdings, we can see which tickers have had the greatest effect on the overall portfolio performance by sorting on Percent of Total Return, as below. Wyndham Worldwide (WYN) and Foot Locker (FL) have damaged the total portfolio performance by quite a bit. Wyndham got killed after its earnings announcement, while Foot Locker was hurt by an analyst downgrade based on increased promotional activity from Nike (NKE). Nothing fundamentally appears to have changed with the companies. AMGN was a scene-stealer, rising 7.4% in the month and accounting for an insane 51.8% of total return in this period. Weighting it at 5% instead of 4% turned out to be a good idea. Prudential (PRU) and Eastman Chemical (EMN) were also not too shabby. Lear (LEA) was hurt pretty badly right out of the gates, down 8.2% just three days in, but it immediately bounced back and has ended up being the 5th best performer in the portfolio over this period. Of course, we can’t make too much of these results yet, we’re just taking the temperature. So far the portfolio as a whole seems healthy enough, with the worst performers from the month not yet causing serious concern. 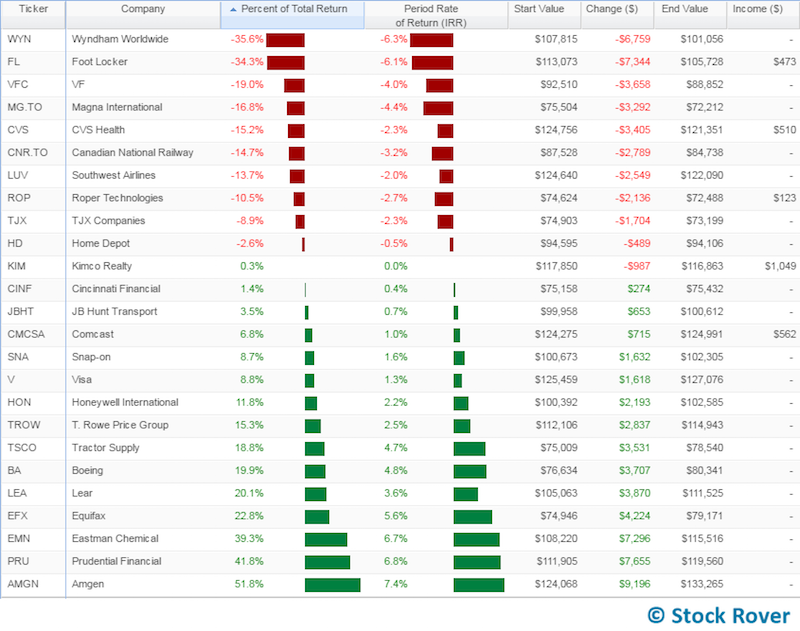 You can download the Dividend Growers portfolio from the Library.